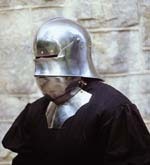 Suitable for foot or mounted combat, this two-tiered helmet was prized by both knights and men-at-arms. The Salade (or English Sallet), which possibly originated in France or Burgundy, was constructed with a tail to protect the back of the head and neck. The version sits flush on a bevor, which protects the chin and throat. The original is believed to be English and dates from about 1480. Our replica features the moveable visor and a bevor with falling buff like the original. Forged of 18 gauge steel, both the Salade and bevor are fully lined and wearable.